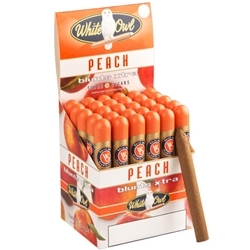 White Owl Xtra White Grape Blunts are infused with special blend of fruity white grape flavorings. This cigar is rolled with a sheet wrapper and binder that encase a tobacco blend which comes from five different nations, making them immensely flavorsome and unique. Popular among a medley of cigar enthusiasts across the world, these classic cigars are perfect for all special occasions and settings. Extremely affordable and reliable, they are individually sealed in tubes and packed in an upright box of 30. Available here at Smokers Discounts!